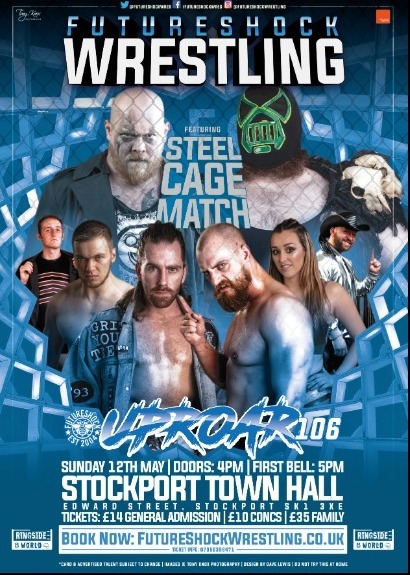 After an incredible return to the town's most iconic venue in March FutureShock Wrestling is BACK at Stockport Town Hall. This time it's a DOUBLE main event as two huge bouts have been signed, both of which will take place inside a STEEL CAGE. The 400lb monster Crater will collide with his arch nemesis Henry T. Grodd in what's guaranteed to be a brutal war. Both men are more than capable of destroying their opponent so what happens when they're locked inside a metal prison? Is any cage strong enough to contain them? WWE's NXT UK Tag Team Champions Zack Gibson and James Drake, collectively known as the Grizzled Young Veterans, scored a win over FutureShock Tag Team Champions Danny Hope & Chris Egan in March. Their win, however, was tainted by some dubious underhanded tactics. Now these two teams face off again in a match where the victors have to escape the cage. The stakes are even higher now as the FutureShock Tag Team Championships will be on the line! All this and more... Don't miss a moment of the hard hitting, heart stopping, high flying wrestling action that's perfect for fans of all ages. On site parking is available for just 50p, the Town Hall is easily reached by public transport and has a fully licensed bar. "First time going and with my whole family who came over for some holidays, to show them what wrestling was about as i have always been a fan and they absolutely loved it. You're gonna see me in every show now"
Awesome show, a lot better than I expected if I’m honest! Staff were amazing and the venue was very good! Audience were into every match and the performers were great, especially ones I didn’t know! Will be looking to go a event again! Futureshock always knocks it out of the park for UK independent wrestling. Great matches and a family friendly atmosphere provide a great evening for long time wrestling fans and people just looking for something new to explore. Just get there early so you can get a seat! "Had a cracking time! will be re attending for sure!" "Brilliant night, loved every minute of it. 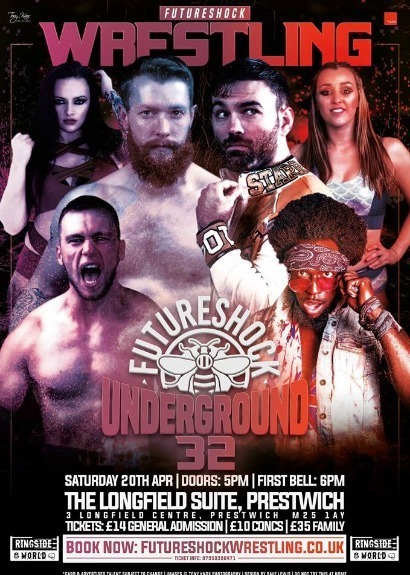 Will be attending more in the future"
FutureShock Underground 32 - Prestwich, Manchester featuring the return of David Starr.